1.1. Prepare outdoor grill for direct grilling over medium-high heat. In small skillet, cook garlic in oil over medium heat 1 to 2 minutes or until golden brown, stirring frequently; cool. 2.In small bowl, stir mayonnaise, cheese, lemon juice, red pepper and garlic mixture. Makes about 3/4 cup. 3.Spray corn with cooking spray. Place corn on hot grill rack; cover and cook 10 to 12 minutes or until golden brown, turning frequently. 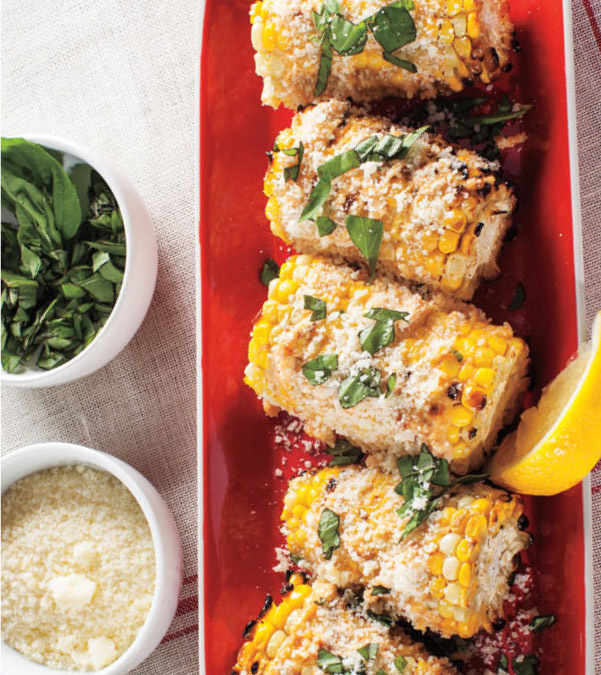 4.To serve, brush corn with mayonnaise mixture; sprinkle with additional cheese, if desired, and basil. Place 1 stick softened unsalted butter, 1-1/2 tablespoons chopped rosemary, 2 teaspoons cracked black pepper, 1 teaspoon fresh lemon juice, 1/2 teaspoon salt and 1 pinch cayenne in a bowl; mix well. Refrigerate for up to 6 days, or freeze for up to 2 months sealed well. Into medium bowl, mix 1 tablespoon fresh lime juice and 1 mashed ripe avocado. Stir in 1 stick of softened unsalted butter, 1-1/2 teaspoons taco seasoning and 1/2 teaspoon salt. Spread grilled corn with 1/2 cup mayonnaise, roll in 3 cup queso fresco cheese and then sprinkle with 1 tablespoon chipotle chile powder.